Buzz…buzz…buzz. Time to rise and shine! 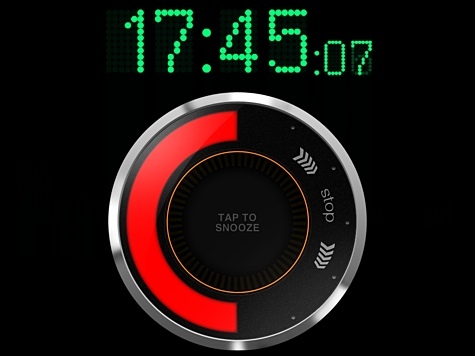 If you have problems getting up in the morning then Tap Alarm Clock may be the solution. 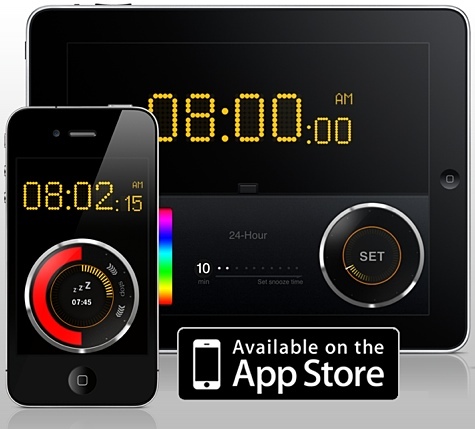 AppAnnex, makers of The Flashlight 4-in-1 and Speed Tracker, released an app that expands the humble alarm clock to be a little more colorful. 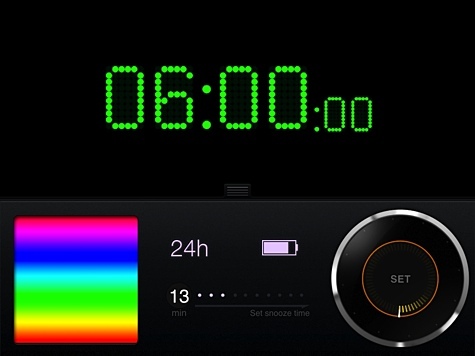 The app is elegant and user-friendly with the ability to present the clock in portrait or landscape modes, switch between preferred 12 and 24 hour formats, set the alarm in either time format, set a Snooze time ranging from 1 to 60 minutes, and select one of 16-million possible colors for the time to be displayed in. Setting the alarm is a breeze thanks to the touch wheel interface. Simply rotate and at the appropriate time tap Set. You are unable to set the exact second on the alarm as 59 seconds or less will go back to the previous minute. When the alarm goes off it features a high pitch beep that isn’t as annoying as it sounds, but it will wake you up. The longer you ignore the alarm the more frequent the alarm beep will become until it is almost a continuous tone. If you choose to Snooze the big Tap To Snooze button will appeal. Tapping the Snooze button will present an additional visual counter until the preset elapsed time has ceased. The same interface also features a virtual scroll wheel in order to deactivate the alarm even when in Snooze mode. Should your device be in silent mode via either the mute switch or simply reducing the volume to zero, then the audible alarm will not be presented. You can turn the volume of the alarm up and down by simply changing the audio level on your iPad or iPhone. You may be wondering what happens if you don’t have the app launched. Will it in fact present the alarm? The short answer is yes. Background alarms require notification settings for the app to be turned on and their maximum length is limited to 30 seconds. The developer has advised they recommend having the Tap Alarm Clock app open and plugged into the electricity for the best performance. Looking at the graphics contained in this review, you would be forgiven for wondering how bright the light would be emitting from your iPad or iPhone at night. The developer has addressed this issue by allowing a simple left to right, or up and down gesture to increase or decrease the brightness. On its lowest brightness setting it is not disturbing when placed on a bedside table. Should you forget to manually dim the display it will automatically dim after five minutes has elapsed. Choosing to leave the clock functionality turned on during the evening will present a heads-up display with the current time, day of the week, and time the alarm is set for. If you use the 12-hour clock you will be presented with either AM or PM above the seconds indicator. The biggest disappointment that significantly lowers the overall score and real world usability is the lack of different audible alarms. Many users would attest to becoming accustomed to a single alarm and therefore not waking up at the correct time. On the iPhone, Apple’s built-in alarm clock has the functionality to use a series of pre-included alarms and the ability to purchase additional tones. This is an area I feel the app developer should further look into to support their existing customer base. I am normally against in-app purchasing but the ability to purchase additional alarms from within the app would be a welcome improvement. Overall, Tap Alarm Clock performs excellently and is very user friendly in its approach to a simple alarm clock. It would be an complete success if different alarm sounds were available. I find this fascinating. With a completely black screen (as in, switched on and displaying black) and fully dimmed (using the OS control) I can see a pool of light on my ceiling and indeed on my pillow if the iPad is within arm’s reach on my bedside table. Adding any form of graphics to the mix of course makes that worse. At full brightness, even with the full black screen, I find it to be an effective torch so long as my eyes are mostly adjusted to darkness. To address this problem, I not only dim the screen but also cover it with a black hessian-like cloth which came as a screen/keyboard protector with an IBM laptop. Even then, with the screen dimmed, I can still see some light on my pillow. The most annoying thing about this? I haven’t tested it scientifically yet, but I believe the brightness slider in iBooks (which is not available to developers as far as I know) gets the screen much dimmer than is otherwise possible with the OS controls. If only we had that level of control either in the OS or for developers to tap into. It is very subjective. What doesn’t disturb me at all clearly causes you problems. It also depends on the ambient night light you are used to. For instance outside lighting such as street lights will have an impact as will moon light. I did some further testing tonight to establish if there was a way to further reduce the intensity that you are experiencing. If you angle the display so it is not directly facing you them it does dim further by the natural angle of the device. You can still see the time without issue but it is unlikely to solve the overall problem you have regarding light on the ceiling. I think I might be more sensitive to light than many. Certainly I cannot stand bright sunlight without sunglasses, but most people can. I just did some experimentation with iBooks and discovered that the dimmer does two things – it both decreases the colour brightness AND decreases the backlight brightness. If you dim a book to the lowest setting and take a screenshot, the screenshot (when viewed at full brightness) shows quite muted colours. 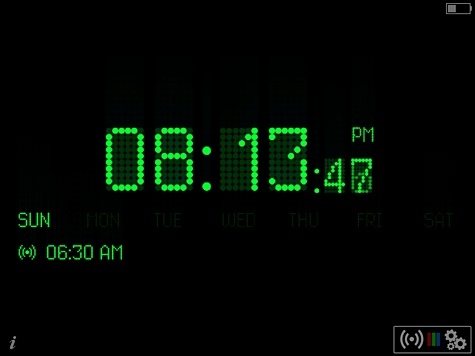 So in theory, an app (such as Tap Alarm Clock) can match the lowest brightness of iBooks. I wonder if anyone makes a case with a tinted insert? There are a number of so-called privacy screen protectors available. Some may assist with light reduction. I personally don’t have any experience with them though.